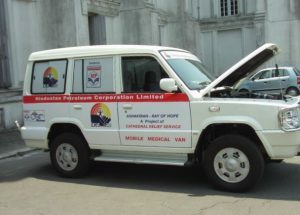 CRS has taken delivery of a new 4×4 vehicle thanks to a generous donation from Hindustan Petroleum Corporation Limited, the leading oil and gas company in India. It will be used as a mobile medical van for the health programme, allowing CRS health teams to visit different locations in both the city and rural areas, and also carry medical supplies to replenish clinics. The vehicle was officially handed over in early April with the Bishop of Kolkata and other members of the CRS Executive Committee in attendance. Cathedral Relief Service (CRS) in Kolkata supports poor and marginalised people in the city’s slums and rural villages further afield through education, health and empowerment programmes, and special projects. Copyright © 2019 Cathedral Relief Service. Powered by WordPress. Theme: Accelerate by ThemeGrill.